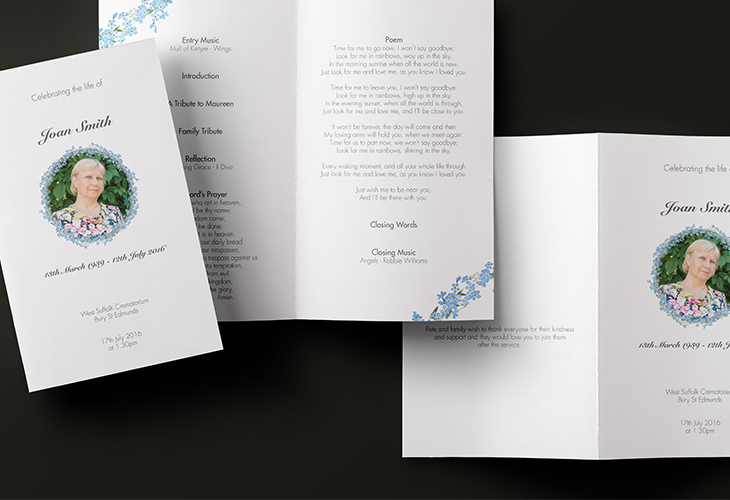 Professionally designed funeral orders of service, in memoriam and memory cards. Organising a funeral can be a difficult and emotional time, but that's exactly where our team can be of reassuring help in guiding you through the many choices available for your funeral orders of service. We'll create a service sheet specifically with your wishes in mind and have a beautiful range of examples to show you. 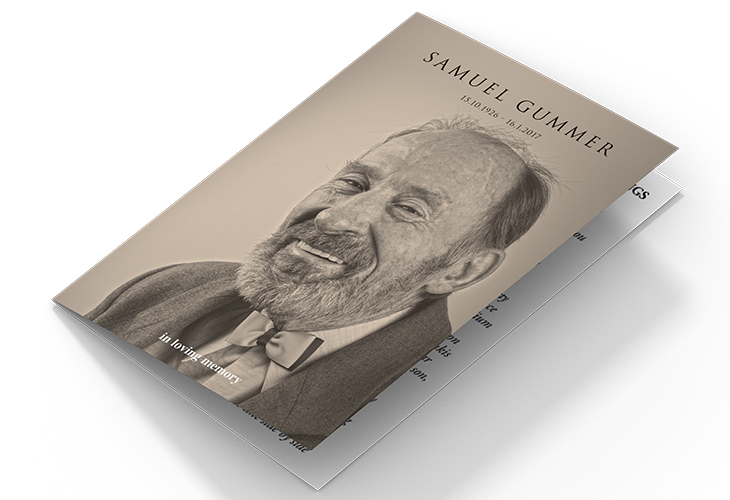 We can print onto a wide range of cards and papers, in either black & white or full colour to provide you with a fully personalised Order of Service. We can also include photographs in addition to the text. 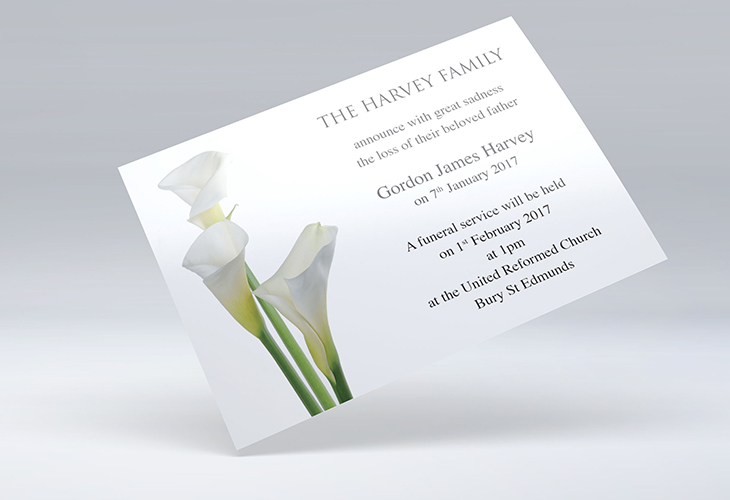 As well as the funeral order of service we can also produce in memoriam and memory cards, providing wonderful mementos for mourners and close relatives alike. 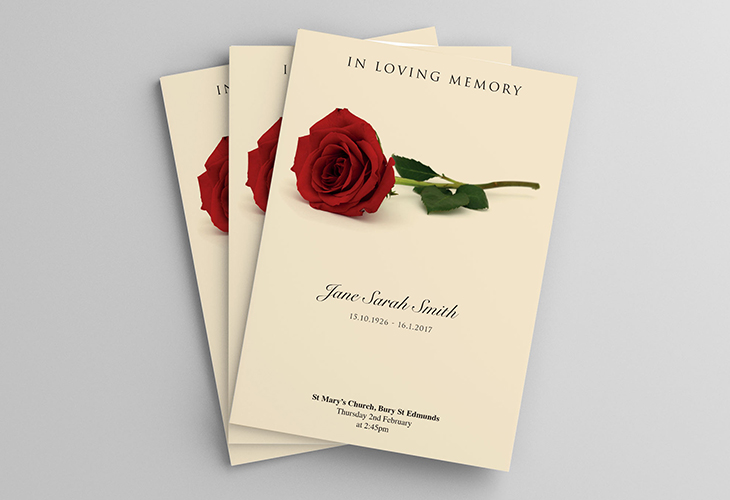 In memoriam cards can be designed with a photo alongside some poignant text, such as a quote or a prayer, providing a cherished reminder of the deceased. A memory card is designed for the next of kin, and provides space for fellow mourners to recount a special memory of their loved one, offering comfort in times of sorrow. We appreciate that timescales are often short and we'll make sure that your Orders of Service are designed and printed promptly to fit in with your own arrangements. We are local, working across all parts of Northampton, Towcester, Daventry, Wellingborough, Olney and beyond, and pride ourselves on providing a personal service. Simply send us an email pbagnpg@xnyyxjvxabegunzcgba.pb.hx, call us on 01604 635177 or call in to see us and we'll work with you to create a lasting memory of your loved one.